"We can't live without other people." As a director's approach to moviemaking evolves over time, many filmmakers begin to develop a distinct and recurring style. Through trademark visual touches and repeating themes, some films even become instantly recognizable as bearing a particular director's unique cinematic stamp. With their frequent emphasis on wandering images and detached characters, the works of Michelangelo Antonioni usually fall into this camp. But Antonioni's singular style did not instantly mature overnight. Instead, it gradually grew throughout the years, and his 1955 effort, 'Le amiche,' serves as an important transitional piece in his filmography. Marked by a thoughtful examination of relationships, the movie enriches its traditional melodrama with potent hints of the modernist aesthetic and existential themes that would go on to fuel the director's later work. 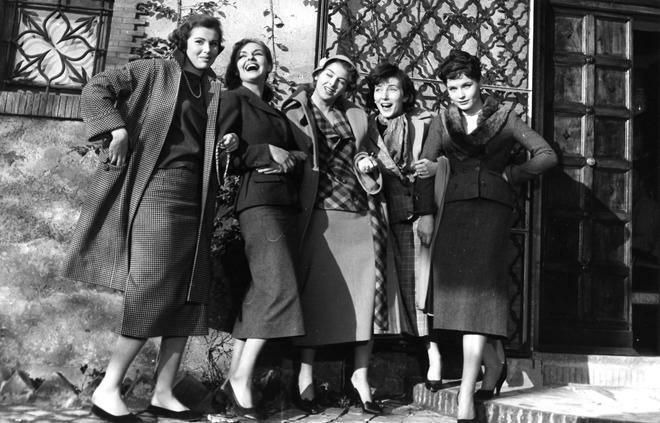 Focused on the lives of five Italian women in the 1950s, the loosely plotted story traces their intertwined romantic relationships and professional pursuits. But when one of the women, Rosetta (Madeleine Fischer), survives a failed suicide attempt, the group begins to reevaluate their life choices and future goals, testing their friendships and potential couplings in lasting ways. 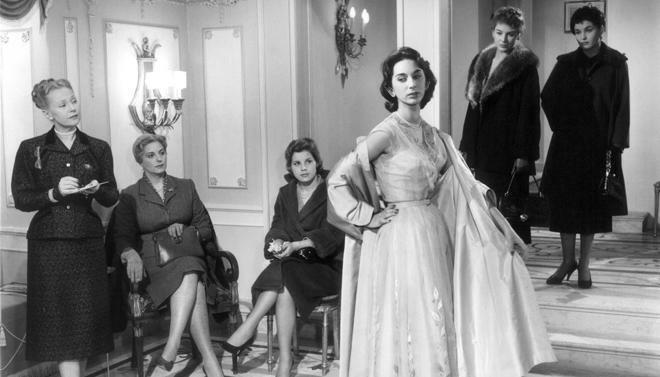 As we move through the faintly episodic narrative, the script eventually emphasizes plot threads revolving around Rosetta's recovery, and Clelia (Eleonora Rossi Drago), a woman who prepares to open up a fashion salon. Their personal journeys begin to offer a fairly engrossing examination of dueling dependence and independence -- with Rosetta continuing to rely on men's approval to define herself and Clelia deciding to focus on her individual goals over romantic entanglements. Additional members in their circle of friends (Yvonne Furneaux, Valentina Cortese, and Anna Maria Pancani) also get their own intersecting subplots to varying degrees, weaving an insightful drama about romantic relationships, class, and societal roles. This all culminates in a faintly subversive finale that undercuts the classic golden age Hollywood train station finale where love usually conquers all with a much more progressive resolution (for the time). With that said, fans of the director's subsequent "alienation trilogy" ('L'avventura,' 'La Notte,' and 'L'eclisse') will likely be a bit surprised by just how conventional much of the plotting here actually is. To this end, despite a few atypical touches, the runtime remains a pretty traditional melodrama. Though Antonioni's later works are rather notable for their shortage of dialogue, here the characters are surprisingly chatty. And unlike the overtly detached and lonely protagonists found in his following efforts -- the ensemble here can be downright breezy at times. Hell, they even smile in some scenes! Of course, an undercurrent of heavy isolation and emptiness is still a large part of the narrative's DNA, and the story does indeed take an unavoidably tragic turn in the third act. Complementing this deeper excursion into seclusion and discontent, is the film's rich visual style. While not on par with the groundbreaking work found in Antonioni's 1960s masterpieces, the aesthetic employed in 'Le amiche' occasionally hints at many of the same techniques that the director would later expand upon in those films. Blocking and deliberate camera movements directly parallel the subtext of several scenes, using the different layers of the frame to position and reposition characters through emotional transitions in extended takes. Likewise, the director often uses buildings, walls, and doorways to emphasize internal beats, blocking actors in or conversely keeping them free to move about. A dalliance on a beach, a conversation between two potential lovers on the street, and a later party sequence are all particularly noteworthy, as they begin to evoke the lyrically wandering quality that would later define the filmmaker's modernist style. Part traditional melodrama and part stylistic stepping stone toward Antonioni's singular aesthetic, 'Le amiche' cements itself as a rather unique and important part of the legendary director's filmography. With hints of the abstract visual and narrative techniques that would pervade his later movies, the film rises above its otherwise conventional trappings to provide a cinematically compelling look at evolving female societal roles and the pitfalls of romantic dependency. There might be a lot less wandering and a lot more chatting, but the director's trademark style still manages to shine through in sporadic bursts. Criterion presents 'Le amiche' on Blu-ray in their standard clear keepcase with spine number 817. The BD-50 Region A disc comes packaged with a pamphlet featuring an essay by film scholar Tony Pipolo. The movie is provided with a black and white 1080p/AVC MPEG-4 transfer in the 1.33:1 aspect ratio. Taken from a 2008 2K restoration of the 35mm original camera negative, this is an overall pleasing image with no major issues. The source print is in very good condition with a light layer of grain and a very clean look marked only by faint lines and other fleeting imperfections. Though the picture veers toward the soft side, clarity is good, revealing various textures and patterns in faces, locations, and all of the many fashionable wardrobe choices. Antonio's developing style is also on full display during select shots, making great use of different planes of the frame with solid dimension. The greyscale is also balanced well, with natural whites. With that said, black levels do appear a tad light at times. 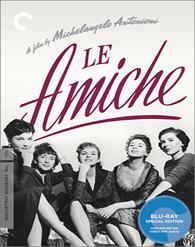 'Le amiche' isn't exactly among the most impressive black and white Blu-ray titles from this era, but the image looks authentic and is free from any troublesome artifacts. The film is presented with an Italian LPCM Mono track and English subtitles. Though there isn't a whole lot to the mix, the single channel of audio comes through quite well. Dialogue is clear and clean throughout with no balance or notable age-related issues, offering a relatively full quality. Atmosphere is comparatively minimal, but occasional ambiance and background effects like crashing waves or passing cars carry solid presence. Range is about on par with other tracks from this era and I detected no egregious cracks, pops, or hissing. The track is quite modest in design, but the audio is technically proficient and overall fidelity is strong considering its age. David Forgacs and Karen Pinkus (HD, 27 min) – Presented in 1080p with Dolby Digital 1.0 audio, this is a 2016 interview with the pair of scholars about the movie's themes. The duo discus the film's examination of relationships, alienation, and class, while addressing the visual and acting style. Eugenia Paulicelli (HD, 22 min) – Presented in 1080p with Dolby Digital 1.0 audio, this 2016 interview focuses on the movie's use of fashion and its place in Italy at the time. Michelangelo Antonioni's 'Le amiche' mixes conventional melodrama with hints of the director's later groundbreaking style. The video and audio are both good, offering an authentic presentation free from any major issues. Supplements are a little light for a Criterion release, but the included interviews are insightful. The movie might not be on par with Antonioni's subsequent masterpieces, but this is still a worthwhile entry in his filmography.